When thinking of Japan in spring, you'll no doubt picture the annual cherry blossom celebrations taking place around this time of year. That custom, known as Hanami, goes back thousands of years and originally centered around plum, not cherry, blossoms. With that in the background, Danish floral designer Nicolai Bergmann presented Hanami 2050, a digitally-enhanced flower exhibition at the historic Fukuoka / Dazaifu Tenmangu Shinto shrine. Bergmann created Hanami 2050 to coincide with the festival, while using the blossoms and their pink colors as a strong theme. 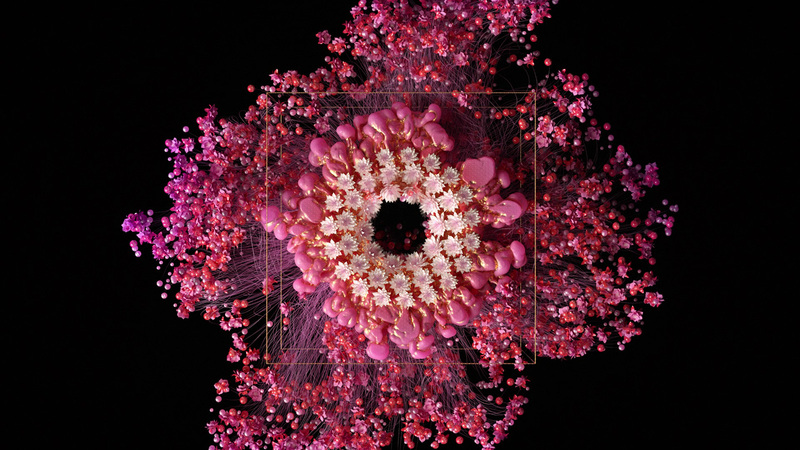 He made digital loops called "Future Flowers" in collaboration with Japanese design firm OneSal. They are displayed on screens integrated into the physical foliage on display. Buds emerge from the main flower, then sprout new flowers fractally like organic, extraterrestrial fireworks. The Fukuoka / Dazaifu Tenmangu Shinto shrine in Japan's southeast hosted flowering shows in 2014 and 2016, but Bergmann wanted to try something new this year. "We wanted to surprise visitors and show them something they've never seen before," said Bergmann. "This time it's completely, utterly new: A vision of 'Hanami' in 2050." That's where the digital part comes into play, adding a future-forward twist to the pink-hued flower exhibitions and pink-fabric-wrapped temple arch. The temple is an apt choice for the digitally-enhanced flower displays. It's supposedly built on the grave of Michizane, a gifted poet who composed odes to plum trees, and a plum tree inside the shrine is supposedly the first to blossom in Japan each year. Generally, the blossoms start arriving around April 7th, but thanks to global warming, they have been coming earlier and earlier each year.